We're going to walk around the edges of the Bank towards the North & the West: a series of narrow triangular spaces just behind the screen wall that need to be tidied up, elevated, re-assessed. We looked at the Reduced Annuities (upper and lower) in the last post but one. I'm not happy with the narrow passage between the battlements and the Reduced Annuities Upper. Was it really like that? Could it be made wider by supporting the upper wall on the joist ends below? Flitch beams perhaps to support the load of masonry offset from the wall below? If the walkway was blocked here, how did the guards get around to the battlements along Threadneedle Street? Hmmm. Note the parapet and stair behind the barracks that I am trying to keep apart. Lots of questions, but we are definitely moving forward. Oh yes, those windows in the tower above the Rustic Lobby, groups of three in each side, but I guess the ones facing back into the upper storey were blind recesses. Something else to get around to. Moving North again to the Doric Vestibule, what I like to think of as the VIP entrance. Off to the sides there were two semi-circular stairs. What were these for? The levels are difficult to reconcile again. There are small adjacent rooms to access, and the upper floor of the Printing Court, but what about the screen wall battlements? I'm starting to think that the two stairs have different functions: one is connecting to the Printing Court, the other takes you up to a flat roof and from there to the wall. More work is needed to figure that one out, or at least to arrive at a plausible solution. Once again I am trying to resolve alignments, anomalies, overlaps etc as it becomes clearer how the spaces fit together. We may never really know exactly what was built, but my goal is to make it believable, and to be consistent with work Soane did elsewhere. Sometimes it's just a matter of splitting walls in different places or making slight setbacks to resolve 3-way junctions in a cleaner manner. Ultimately I want to be able to tell an interesting story about the history of the Bank and its architects. That's not going to be possible as long as the model remains awkward and incomplete as soon as you stray away from the major spaces that are well documented. The walkway around the top of the screen wall has been modelled with parapet walls on both sides. That is correct in some cases, and I based it on drawings from the archive. But other drawings show it as open to the inside. In fact it seems to be a stone slab cantilevered out over those narrow internal yards. I know they didn't have health & safety regulations in those days, but this seems unduly reckless. My guest is that there was a basic iron railing, which is not showing up on those sketches. That's the interpretation I'm going for anyway, adding railings and supporting the cantilever with a bit of corbelling below. When we get to Tivoli Corner I have decided to create a flat terrace behind the "attic sentry box" I think that's the only solution that makes any sense. The area is too small and oddly shaped to accommodate a small piece of pitched roof. There are a number of small rooms in the space below that need to be looked at, but for the moment I am cleaning up the exterior. Let's move on. So next we come up to the Soldier's Gate and the yard behind which gave access to Soane's New Barracks Block. Based on my current levels we need a few steps down from the street into the yard, so that's what I'm showing. No corroborating evidence for these but the alternative would be to drop Lothbury down much lower. Maybe I will take a look at that possibility later on, but for the moment we are having steps down into the yard. The elevation of the new Barracks was a mess. All I have to go on here is the floor plan but I think the solution shown below is a big improvement. So once again I am taking an educated guess and moving on. Maybe some additional evidence will catch my eye. now I know what I'm looking for. So on we go, heading East down Lothbury we come to another triangle. This is where Princes Street used to terminate before the NW (green) Extension was built. That's the reason for the curved corner. That was the outer edge of the screen wall when Soane first enclosed the properties that were acquired for his NE (orange) Extension. I think that portion probably remained blank after it was incorporated into the site. But the Printing works was new, and needed to get light and air from both sides. It's quite scary when you look inside parts of the model that have lain neglected for a year or more. The central decorative feature of the Lothbury screen wall clearly backs into an attic bedroom in the residence court. but has been modelled as if it was open to the world on all four sides. Then there are walls that stop half way up an upper room. I also spent some time adding placeholder fireplaces to these spaces and converting rectangular openings into "real" doors. At the far end of Lothbury we come to the Consols Library, a structure that was rebuilt as a copy of Taylor's original: four storeys of brick vaulted storage around a central light shaft. This is a linked file, built originally as a study one weekend. One corner was sticking out int the apse at the end of Lothbury Court and another overlapped with Russell's C.T.O (Consols Transfer Office) which is also a link. I've learnt a lot since Russell built this. Photos and survey drawings show that some of the drawings he used were early design schemes, so there are some small adjustments to be made. I made a start on this, modifying the niches for example. For the moment I'm just doing what is needed to clean things up at the junctions with the main model. Will come back later to give this space a more thorough review. 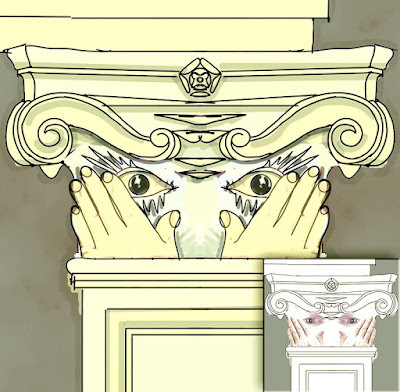 The toothed stonework shown on some of the window surrounds was taken from site progress sketches. Photos show that the final treatment was much simpler. Once again there are triangular light courts to elevate and stairs to resolve. Lots of residual spaces to review. You see a semi-circular lobby in plan and place the wall, then a couple of years later think about the ceiling above. Perhaps it should be hemispherical. What about a lantern? Not sure about that though. Half a lantern? Would he do that? Russell had a lunette at the West End of the CTO. 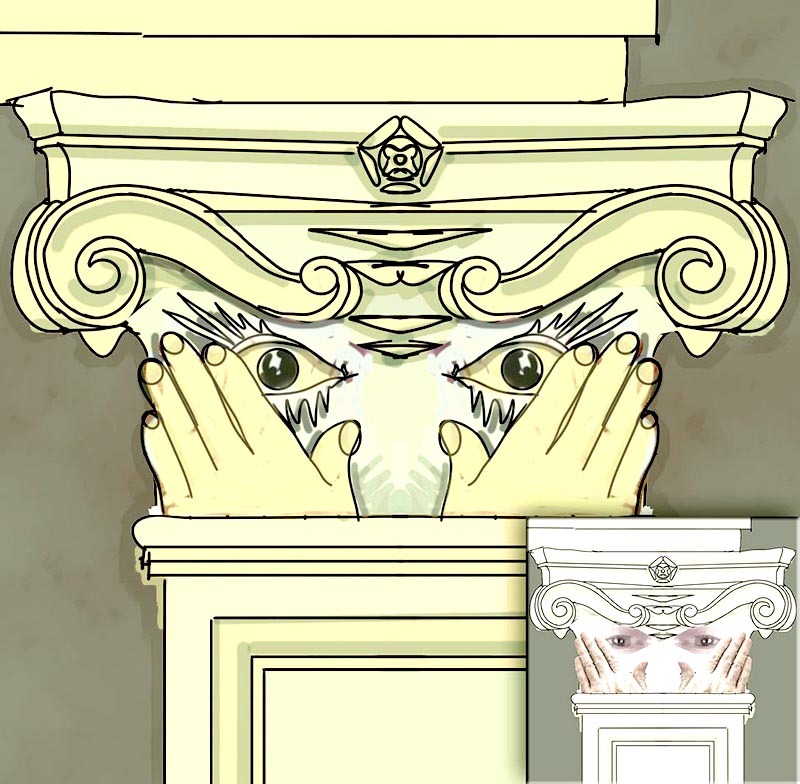 I think that's based on a Soane archive sketch, but photos show a wide window with a segmental head and 5 divisions. Now that we can see everything in context it becomes clear that a staircase clips the lunette. I guess there's a reason for everything. That staircase is giving access to Sampson's rear courtyard block which had three floor above ground (plus cellars) This is at the corner where the original Bullion Passage came in from the East. It's fascinating to know my way around this jigsaw puzzle of a building so well, considering it was demolished almost a century ago, and that the passage I just mentioned was moved more than a century before that. I really do feel that this is an immensely powerful way of studying the past, ( i.e. getting inside the spirit of a period by way of a BIM authoring package) and something that more people should be doing. The last post featured hand sketches attempting to analyse Soane's design development process in framing the façade around the Bullion Passage. Future posts will deal with the passage itself and with further development of Residence Court. After that, who knows? Time for another progress report on Project Soane. I've been trying to flesh out the neglected regions, the blank, undeveloped rooms and spaces that still exist in the model. Two months ago I decided to tackle the Reduced Annuities Office. This is part of an L shaped wing, built by Taylor towards the end of his life. There were two rooms: a square one in the corner, lit from above by a large circular lantern, and a rectangular one forming the western boundary of Garden Court and lit by three large Palladian windows, overlooking the court. Soane built an upper room above this second space, as shown in a previous post. https://grevity.blogspot.com/2018/10/going-up.html At the same time he connected the two lower rooms, replacing the dividing wall with a triple archway which maintains its structural function, supporting the wall above. 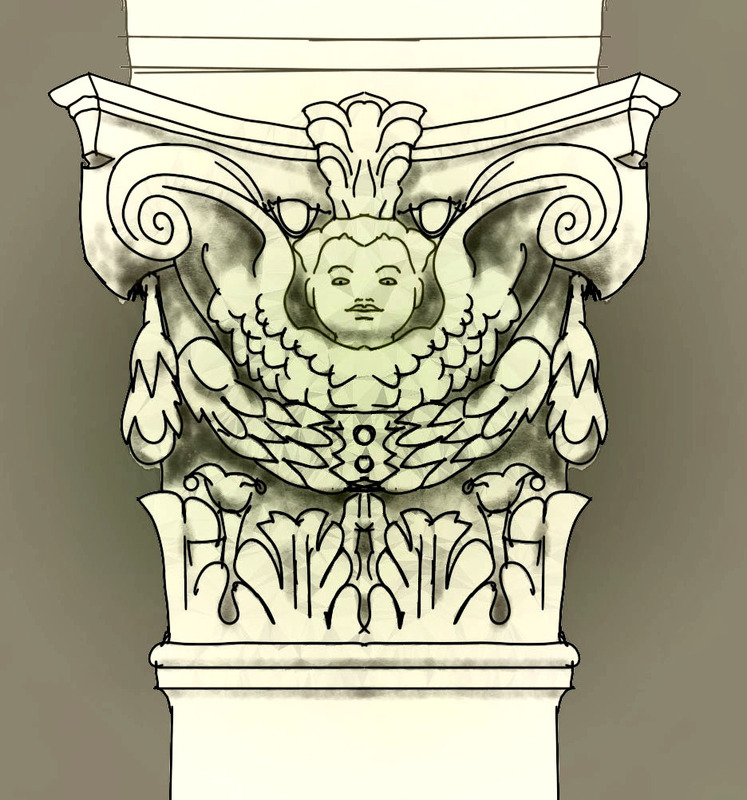 There are perspective sketches of this feature, made by Soane's pupils during construction. I found it difficult to reconcile all the heights, but made significant progress. It's starting to look like a real space. A number of anomalies remain to be resolved. The long side walls of the upper room are set back from the parapets of the walls below. Just how was this achieved, structurally? I would like to think that the walkway around the battlements overlooking Princes Street was maintained along this section. But how would you achieve sufficient width? The thickness of the screen wall itself doesn't seem to be enough. These are questions for the future. Meanwhile I started to look at the first floor rooms above the Old Barracks Block. This was one of the first structures built by Soane and was unusual in having an upper storey. I think this was originally the location of the printing works where bank notes were produced. Much later, when Waiting Room Court was built it became part of "T" shaped suite of rooms. Soane didn't leave us any floor plans for these upper levels, so how were they accessed? There is a staircase close to the corner of Garden Court, which presumably also gave access to the room above the Reduced Annuities office. But there are lots of problems as I discovered when I tried to model it. I have to believe that the stair was set back from the parapet around Garden Court so as not to disturb its continuity. I came up with a somewhat implausible arrangement where the stairs wind around and finally reach the upper room via a couple of short flights and a section of open flat roof. I couldn't see a better way to connect the various levels and half-levels together. The grand spaces around Garden Court have rather high ceilings compared to the much humbler rooms of the Old Barracks block, which was tucked away in a rear yard. Once again I have opted for putting a solution in place and continuing to reflect, gather information, keep an open mind. The Old Barracks was the next item on Taylor's list when he died. It's not clear whether Soane designed it from scratch or modified a plan left by Taylor, but there are a couple of elevations in the Soane archive. I used these to inform my work. There is a symbolic "cannon ball" feature still to add and the cornice is not quite right. It's interesting that he took such care over an elevation that faces into what is essentially a narrow light well, possibly containing privies for lower level staff. The levels shown in this yard are speculative, and moving north we come to the complexities of the corridors and stairs on either side of the Doric Vestibule. It's typical Soane, with lots of stepped levels allowing for side light to enter the building in unexpected ways. As usual the various drawings in the archive don't quite match up. I made a lot of progress. All these areas were developed in an ad-hoc manner. Walls have been split and adjusted in height repeatedly. I'm using face-brick for these "back-of-house" zones, partly based on drawings, partly because that's what he usually did. Some of the walls need to be split to allow for narrower parapets above roof level. It's nice to be getting to that level of detail, and to see these marginal zones starting to hang together as believable parts of a Soane building. Coming to the Doric Vestibule, I started to adjust the walls and vaults below the half-level of the entrance lobby. Grids were not showing up in some of the working sections, a sure sign that the section plane is slightly skew. This whole area is set at 5 degrees to Project North and it's very easy for inaccuracies to creep in. I set up a view and used colour over-rides to turn sections green once I had verified that they were aligned correctly. It's such a complex structure, you really need dozens of sections to pick up all the subtleties. Quite a lot of time went into regularising angles and dimensions. Tedious, but it will pay off down the road. A good long session developing the cellars was long overdue. I have a couple of parametric families for the vaults and arches which were enhanced to include a "flatness" parameter that maintains a proportional "rise" value as you vary the span. It's becoming clear that there is a progression from some of Taylor's work which was built without cellars, through the majority of the site which has grid of walls supporting brick groin vaults, and ending at the lower end along Lothbury where the basement is effectively at ground level. It seems that there are no vaults here, but rather timber floors like those on the upper levels. Let's conclude with a couple of Enscape images of that RAL space. Enscape is great for giving a sense of the quality of light in this space. When you look back from the side-light space, the portion below Taylor's lantern really glows with an ethereal light. But when looking back the other way, the effect is somewhat different. Is there something about the way that Soane's treatment of daylighting animates the process of moving through a sequence of spaces? The final collage deals with the three windows. Actually the bank had Soane erect a partition, dividing two of these windows off into a separate room, but I couldn't bring myself to do this. What was it like to be a clerk in one of these offices, I wonder? To be a cog in the wheels of finance at the moment when the Industrial Revolution is unfolding. When the longstanding tussle between England & France is about to tip in England's direction, partly because of the financial stability underpinned by the very institution you are working in. Difficult to grasp that the work of filling out ledgers by hand, was the equivalent of today's cutting edge cloud database. The accuracy of the Bank of England's record keeping was legendary. Would you feel a sense of wonder at the pace of change, knowing that the trees outside had only recently belonged to a churchyard established in medieval times? I've been sketching on my phone at odd moments, often while trying to drift off to sleep in my bed. I think I am gradually adapting to a digital toolkit. Ultimately it has to become a kind of "muscle memory" thing, so to some extent you just have to put the time in and see what happens. Focus your conscious attention on higher level questions, and let your subconscious self develop its skills in the background. At times I just scribble out the first thing that comes into my head. 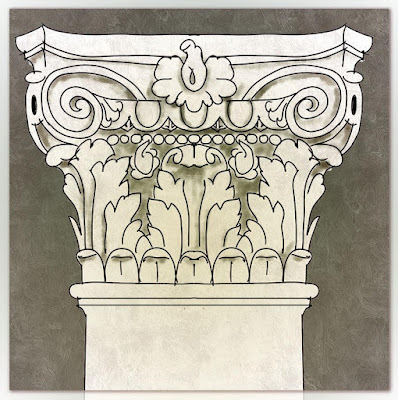 Recently I have been doing a series of pilaster capitals. It's a way of gaining a deeper understanding of the enormously rich variety that is possible within the rigid discipline of "the 5 orders" I've been modelling these things in Revit, but sketching them by hand gives a completely different set of insights. I've done four in the past few days: mostly composite. but one of them is probably more Ionic. Sketchbook Pro has layers, so I usually save out a line drawing, then do some fill and brushwork, save again and process the result in an app to soften it a bit, or adjust the colour balance. Let's start with a fairly straightforward "Composite". Why is this not Corinthian? Well the scrolls are a bit bigger, more compact, and connected by a row of "egg and dart" running ornament. 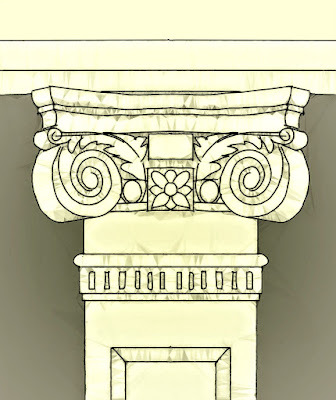 That's typical Ionic, subtly different from the volutes you would see in Corinthian. But Ionic would not have the broad band of acanthus leaves. In this case you have a row of "baby leaves" with three full size ones above and behind. Often the lower row would also be full size leaves, two leaves aligned with the gaps. 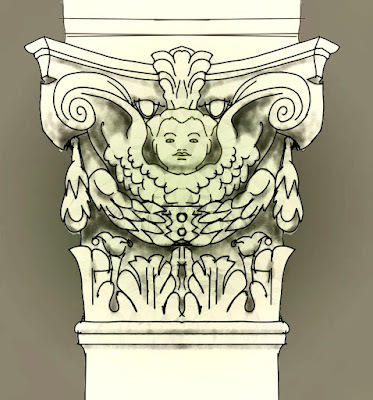 Next we have a rather elaborate and esoteric interpretation of the composite, with both a winged cherub and a festoon inserted in place of the upper row of leaves. The festoon is a kind of garland, as if the decorations hung on a building during festivals had fossilised and become a permanent part of the building. Soane used festoons quite a lot, often with ribbons flying out, curling and folding to fill our the spaces on a rectangular background. How are you going to model them in Revit? It's an interesting challenge. I've made some progress but not really get their yet. 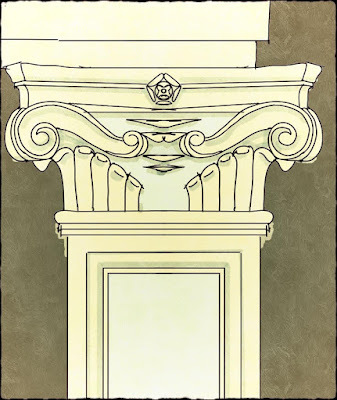 Third up, I'm going to call this Ionic, because it lacks the rows of acanthus leaves. 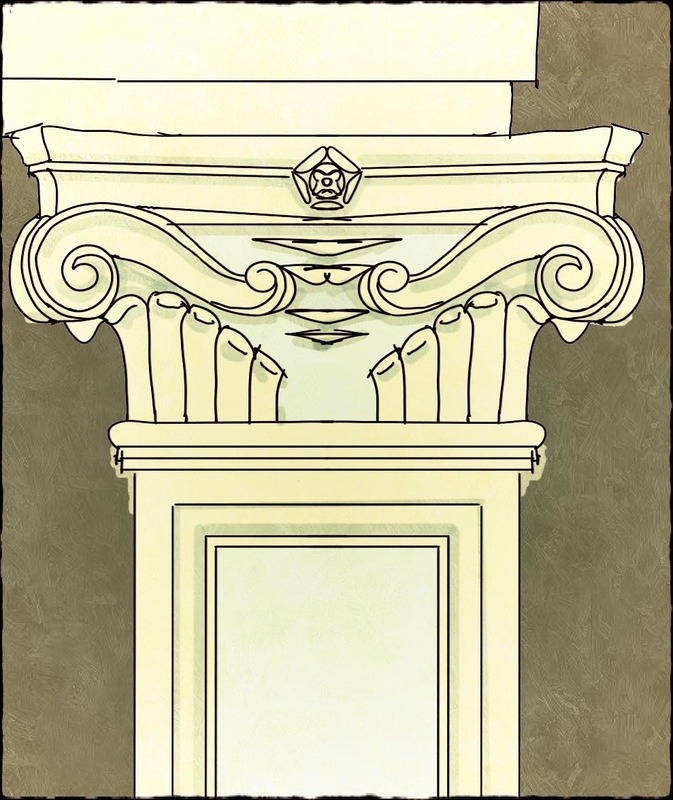 The rosette, or fleuron has been dropped down from its usual position on the top moulding (Abacus) to the egg and dart row which is almost obscured. 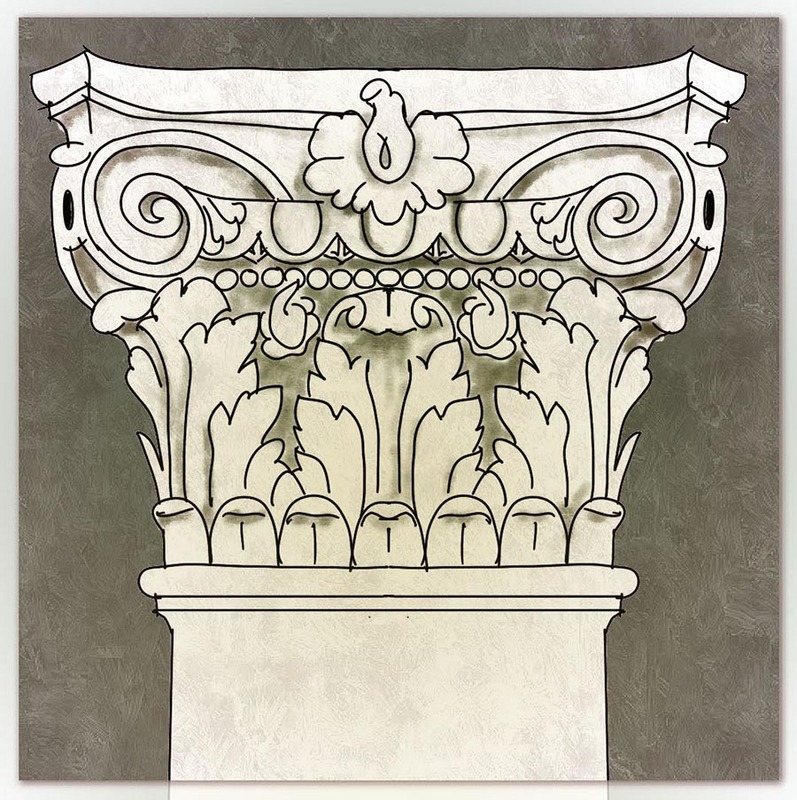 These are all capitals to shallow pilasters, shallow projections dividing up the wall surface rather than having a structural purpose. In this case the shaft itself is treated as a panel with a rectangular recess, as if it were a board, held in place by a moulded bead. And finally there is this strange beast, which I think is from the V&A, a splendid museum that I visited when last I was in London. I guess it's composite, but both the leaves and the volutes are rather unusual and abstracted. Once again the shaft is treated as a panel. These S shaped scrolls interest me. I've seen quite a few different versions, in one case interpreted as Dolphins. Somehow classical architecture seems to be very comfortable with sliding between realism and abstraction in a quite unselfconscious manner. Leaves, animals, faces: rectangles, circles, spirals; it's an endless game of exploring the border between order and chaos. The leaves in the last example suddenly reminded me of fingers, and the volutes seem to be eyebrows, so I was motivated to make another rather playful sketch. Can we invent new capitals in this day and age? Of course we CAN ... but the meaning may be different in a world where the classical language is no longer the default mode of building. It becomes a rather self-conscious, tongue in cheek gesture. But let's keep our feet on the ground. 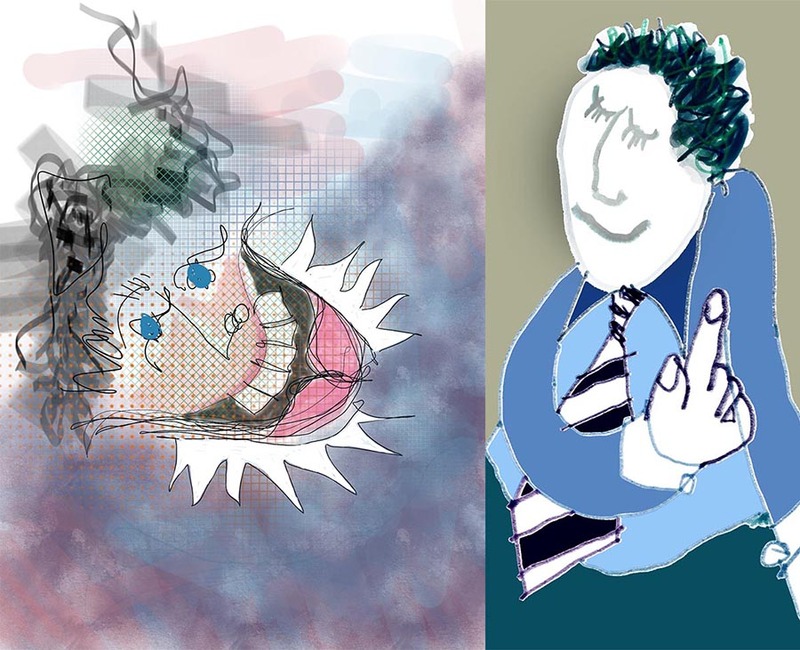 I am learning to become more fluent with my digital pencil: getting the hand-eye-brain loop moving again at a subconscious level. And I am continuing to probe the classical orders and associated motifs, reprocessing images that I have collected over the past decade or so in various cities: exploring the variety, the rules, the pitfalls even. Some of this will surely feed back into Revit and my "Heritage BIM" studies. A couple of posts back I put caryatids as placeholders for the four statues that stood guard over Soane's triumphal arch on the south side of Lothbury Court. Soon afterwards I got a message from Russell Fuller Hill who did such a fantastic job of modelling the Consols Transfer Office, way back in the early days of Project Soane. He was the original source of these caryatids, and offered to come up with a few more examples. Sure enough, a week or so later he sent me a link to half a dozen "Greek statues" gleaned from the web. They aren't close matches to the figures that Soane used, but at least we can have some variety. In any case, a placeholder is not meant to be a faithful representation. We just want to say, "here are four different statues in a classical style". So I have taken Russell's statues and a couple that I found myself, and turned them into a little collection... to be enlarged upon as time allows. Russell's approach to mesh geometry is to give the "spiders web" a pale colour so that it fades into the background. It's a simple solution, but I'm not happy with the orthographic, hidden line views that result. I want to see a black outline and a little bit of detail, so that the statues a represented in the same general way as all the other geometry. 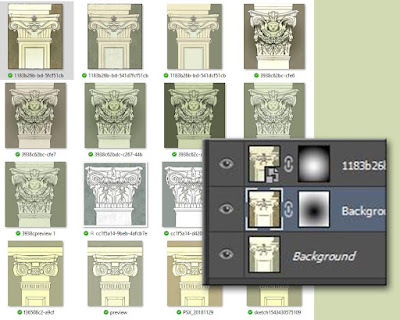 This is achieved by processing the image with 3dsMAX. Now I'm a complete novice in Max, but I stumble my way through a hack that I picked up on the web by groping around the interface. My first attempts to do this were abject failures. It was simply deleting faces, leaving gaps everywhere. Did I forget something? Is there something different about these meshes? Who knows? But I fixed it by fiddling with the options. I'm using the "ProOptimiser" function (Modifiers/Mesh Editing/ProOptimiser) and the key variable seems to be the "Merge Vertices" tick-box. Check that and play around with the percentage figure until the faces/after number gets down to 30k. Then export to 2004DXF. For some reason that will remember the edge hiding that you do in the next step. Export to 2004DXF again and you have a CAD mesh that imports into a Revit family, looking the way I like it to look. For some models that's all you need to do. For the statue of Hera (I'm pretty sure that's who she is, goddess of motherhood) The simplified mesh is OK-ish but a bit crude when you zoom in. So I included two versions in the family, with an instance visibility switch. So when you are generating renders in Enscape3d, you get the nice smooth look. In my collection, I've made these as Site category (maybe I want to host some statues on Topography) but inside there are double-nested planting families, so the whole thing scales to whatever you type into the Height parameter. But I'll leave all that to another post.